Welcome to Day #14 of the Restoration Project. I need a rest. I’ve been loving this series, but I need to kick back a little bit today. I love what Crystal Paine said on her Friday Periscope, My Top 3 Tips for Getting Stuff Done. She said to keep your to-do list short. I was surprised because I expected that Crystal’s to-do list would be long with all the wonderful things she has going on. But, then I realized that one of the reasons she is successful is because she keeps her lists short and completes them. I heard similar advice from another successful blogger, Kat Lee, at Declare. She does a Power Hour, where she sets a timer for an hour and stays focused on a task until it is completed. If she finishes the task before the hour is up, she moves on to the next task on her list. Both Crystal and Kat’s tips were revolutionary to me. Sometimes we need to make better use of our time so that we are more effective and don’t wear ourselves out. We need to be realistic with our to-do lists and keep them short and focused so that we have room to rest and space to breathe. I tend to have a to-do list that never ends. It is long and overwhelming. I often jump from one thing to the other before finishing a task. So today, I am trying a short list. My list has a few more than three things, but not too many more. One of those things is to read part of a book. Putting something relaxing on my list is a step in the right direction for this task-oriented woman. So today, I’m revisiting the gift of rest by linking you over to a post I wrote this summer for my friend Kristin Hill Taylor for her Three Word Wednesday link-up. Click here to read more about The Gift of Rest. I hope you’ll consider linking-up with Kristin for Three Word Wednesday and that you’ll get to know her and her precious, growing family. You can find Kristin’s book, Peace in the Process on Amazon. P.S. 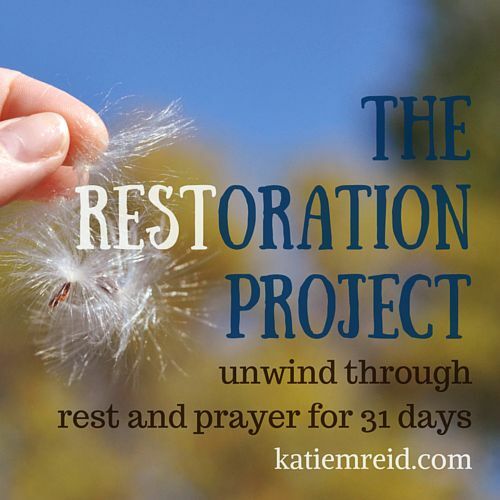 Read Day 1-13 of the Restoration Project.